One of Lizzie Brash's daughters has admitted to being the culprit who did not know how to flush the toilet properly, six years after the video of her X-rated tirade went viral. 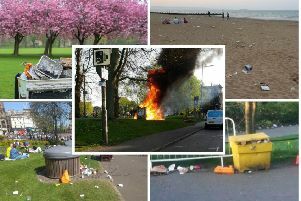 FOR almost six years, it has been Scotland’s most disgusting whodunnit. But now, a previously unseen video confession may have finally shed some light on who does not know how flush the toilet properly. Oxgangs mum Lizzie Brash gained viral status in 2013 when she burst in to her daughter’s bedroom and unleashed an X-rates tirade at the girls. The video is timestamped November 14, 2014 - a year after the initial clip went viral. However, Twitter user @grantjcn discovered a video dated November 14, 2014 reveals the younger of the two sisters admitting she was the culprit. Talking directly to the camera, the girl says: “It was me who done the s*** in the toilet. “Whoever thinks it wasn’t me, it was me to surprise you. The video, dated November 14 2014, which was posted by Twitter user @grantjcn, was captioned: “I can’t believe after five years we finally know who it was that never flushed the s***. It comes just days after a family friend admitted they still have the catchphrase shouted at them in the street.